For those of us who like things natural DeFeet has produced wool socks for our enjoyment. 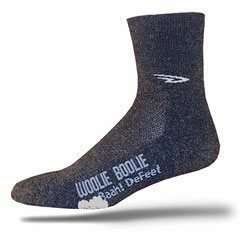 The Woolie Boolie could easily be described as a mid-weight sock whish is roughly twice the thickness of the Air-E-Ator. Like all Defeet wool socks it's made of superior quality Merino wool which breathes better than just about any other wool out there. Being a natural fibre wool has intrinsic wicking capabilities understood only by sheep and wearers of DeFeet wool socks. Let's just say you have to wear them to understand. They're comfortable in the chill of winter and during the heat of summer.